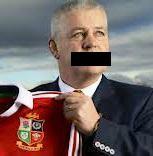 So, Warren Gatland has been named UK coach of the year at the 2013 UK Coaching Awards. Apparently for "masterminding" the Lions' series win in Australia this summer over a poor Wallabies team whose coach was sacked immediately thereafter. True, it should better go to any of the coaches who didn't win the 6N and had a similar level of success against South Africa and New Zealand. Gatland didn't win the 6N. He was on Lions sabbatical. So Gatland wins UK Coach of the Year (that's for all Sports, not just Rugby) on the back of winning 2 matches against a struggling Australia - that's my point. I'm not saying any other UK rugby coach should have won it.